Indian Jail rules different for ordinary thief and VIP thief especially when the VIP thief has looted all the Indians through the exchequer! Different set of rules for the high lords! 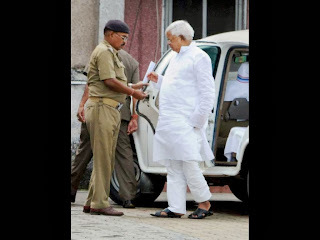 You may have learnt by now that the ex-Chief Minister of Bihar, Mr.Lalu Prasad Yadav has been sentenced to years imprisionment for his part in the Rs.940.00 crores and counting fodder scam which took place in late 1992. The CBI special court gave this verdict at 2.30 pm IST. Lalu is lodged in the Birsa Munda Central Jail in Ranchi for his crimes. I am glad that the judiciary is taking positive action against the people who till now have been untouchables as far as law is concerned. This sentencing and its aftershocks may prevent the high lords of India from looting our beautiful country. But at the same time I am dismayed by the way the Indian Penal Code works. As per the Indian Penal Code Section 379, 1860 a thief is person who commits a theft. The max prison sentence for the person who is proved guilty of theft is 3 years and a fine. "379. Punishment for theft.-- Whoever commits theft shall be punished with imprisonment of either description for a term which may extend to three years, or with fine, or with both." Now this imprisonment is for normal thief who steal money from you and me. He/she is then put into the prison and made to do menial work as per the prison manual. The Government then pays him/her as per the schedule of rates. Now in Lalu's case the CBI Court has charged him with more severe IPC sections under which the quantum of the sentence and fine are both more than a normal thief. Mr.Lalu on the other hand has looted the Indian exchequer of Rs.940.00 crores which by default means that he has committed theft with every Indian. But the news reports (see the video above from HT) suggest that he is treated more like a son-in-law of the state. His crimes are graver than a ordinary thief then why is he given VIP customised service in the prison. I was really surprised reading the papers that the prison manual states that VIP prisoners are to be provided longer visiting hours in comparison with regular inmates, an upper division cell with a TV and two cooks, a generous supply of rice, fresh vegetables, mutton/chicken or fish, ghee, and seasonal fruits and the option of getting food from outside, are just some of the entitlements. My first question to the Indian authorities is that isn't Lalu a thief who has looted this country. If he is already proven guilty of wrong doing how the hell is he a VIP? A ordinary thief is made to slog in the prisons where as the so called leaders after enjoying 50 percent of there lives fooling people are now living with 5 star like amenities in the prison. How will a thief repent on his wrong doings if the state provides his with honorary chicken/mutton, ghee and fruits with the money we pay as taxes to the state exchequer. Not only is this absurd but this shows that the VIPs after committing the crime are still able to rule the roost inspite of the convictions by the hon Court. If this is so then why are lakhs of ordinary thieves made to do menial work and provided with shoddy cells often cramped. Why is Sanjay Dutt, with tendered his heartfelt apology to the nation made to do menial work. No I am not writing this in favour of Sanjay Dutt, but it seems a bit odd to me that a thief who has looted the nation is still enjoying the perks of office. The very same office which the Hon Supreme Court has already disallowed through its historic judgement against people sitting in high office after being convicted. It seems to me that for Lalu only title of Member of Parliament has been removed per se but he is still a MP as per the prison manual. Isnt it time now to change these stupid British era rules and make the wrong doers face the music. Hope some day the Supreme Court will notice this lacunae in Indian laws and put a end to it! *I dont know whether the prison facilities will be different now as Lalu has been convicted. The facilities stated in the post are at the time when he was remanded into custody for sentencing on Monday. Expenses are more for criminals in our country, when we can give VIP treatment to Kasab, Laloo Prasad will surely be well looked after and fed a lot more than fodder.